While on vacation this past week, I was thrilled to open my e-mail and discover that I had won this 1970s NOS 18k white gold broad nib fountain pen on Ebay. I was even happier to discover it waiting for me at my office when I returned, considering I paid for it on Tuesday and it arrived from Japan on Friday. It arrived more quickly than a Cross pen that I purchased from the Midwest. This is my first "pocket pen" and it is in perfect new condition, even though it is about 30 years old. Unfortunately, I failed to order ink cartridges with it so have not written with it yet. The description, price and service from Sakura Zeppelin were outstanding - I highly recommend her and look forward to future purchases. 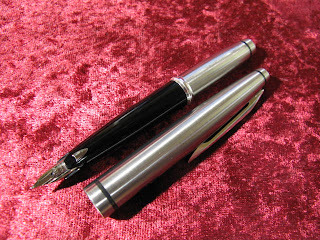 For more detailed informaton on Japanese pocket pens, see the recent posts on Inkophile. Previously, I wrote of my disappointment with Levenger's Decathlon Fountain Pen, which I returned because it did not live up to the "firm handshake" metaphor in the catalogue description. However, I read so many favorable reviews of the Levenger True Writer series, that I wanted to give them another try - and besides I have been very pleased with most other Levenger items. Correspondingly, I was becoming very intrigued by the idea of demonstrators and nearly bought a Pelikan or Sailor demonstrator but both were too pricey. Levenger put their colorful demonstrators with matching bottles of ink on sale, as if they read my mind and wanted to clinch my decision. It worked. I recently received a Lamy Vista demonstrator with a 1.1 Italic nib, which is filled with Waterman brown ink and so apart from the modern look and feel of the fountain pen, the result is something wonderfully antique in appearance. I was surprised by how much I enjoyed using so much ink and having that much color present while you write. I am usually just a black and white thinker and writer. The experience with the Lamy demonstrator compelled me to buy the red bold nib demonstrator from Levenger and I could not be more pleased. At a fourth of the price, the Fireball is much more satisfying than the Decathlon and the intensity of the red ink is as bold as the nib. Since the Lev enger nibs are interchangeable, I am ordering a green and blue demonstrator from Levenger with a fine and medium nib to complete the set and add more colors and nib combinations. By the way the broad nib True Writer writes amazingly smoothly. That was such a success that I sent in one of my Pelikan 215 fine point nibs to ChartPak to be exchanged for a broad nib. Pelikans also simply unscrew and are interchangeable with one another. Plus ChartPak will exchange them for free!